This is a two part series on integrating IA and Application Control into Active Directory AD. Lately I’ve become an IA “expert” (insert smiley). Well I exagerate but I wanted to share some of the things I learned while App Control integrating into a large AD forest. First step is integrating IA. IA is used for 2 things: authentication for access control by the gateways and identity translation by logging server. IA will keep track of what users are on what IP address. This is done by SmartCenter and gateways registering with AD via WMI to get notices of when people log in. NOTE: more specifically the gateways have to register with EACH domain controller at EACH site throughout the forest!!! Not just the top domain. The domain controllers keep track of logins/logouts, not the top level domain or the top global catalog. Sites are easier to manage because permissions are set all at the top and not each individual domain controller at all the sites. Once you have this info you are ready to start. 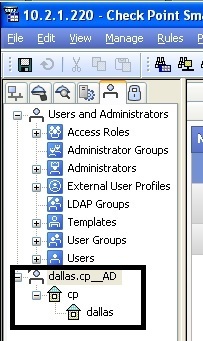 Go the the servers/OPSEC tab to create LDAP account units or the users tab to edit the units (right click). One the first page you have to specify what domain you will be querying. NOTE if its a site you use the top level domain acme.com, if its a subdomain then enter the subdomain sales.acme.com. I like to make the permissions read-only, no one can blame the firewall for screwing up AD. I like to use wbemtest.exe in Win7 to verify DC credentials on a DC by DC basis. So assuming you got all that working, the first test is going into the user tab and double clicking on an LDAP object to see if it retrieves AD information. For sanity check you can tcpdump port 389 on SmartCenter to verify the query actually went out (sometimes it hangs). If this works, then theoretically you are a LDAP expert. For extra points, remember these commands. will dump the adlog database of user->IP. Make sure all have connectivity. If they don’t they you screwed up your credentials, DNs, firewalls blocking ports to the DCs. cpstop;cpstart works miracles too. Make sure your AD account is not getting locked out by looking in AD security logs. pdp is the process that monitors user activity and keeps track of recent events coming from AD where credentials are required. File mapping is probably the most common, log in and some log outs(if someone formally logs out). pep is the process that is referenced to enforce security decisions based on user credentials. These processes can sync with each other throughout a network of firewalls that are participating in a AD Identity Awareness forest. There are optimization where firewalls share pep information and don’t have to get it from DCs and flood WAN links. Dumps user records showing which users are being used to enforce security decisions. 1) Fetch Branches will NOT verify credentials and will reset the DN string. 4) Firewalls lose credential info – Make sure you put a username into the blocked pages in active portal. If these start coming up blank you know that firewalls are losing credential info. 5) NOTE: SmartDashboard does NOT verify LDAP account unit credentials for domain controllers!!! Make sure you get the right credentials. Check your AD security event log to make sure the LDAP account is not getting locked out. WARNING: You will get weird random rippled login failures that are a pain to track down. Sometimes it works, other times all the DCs are locked out. Has to do with the AD lockout and delay in DC replication. I now know that I have to be a total geek and will never make it in sales. IPS, DLP, NAC, AV, app control, URL filtering get all the glamour. More gadgets to build a security empire. But logging….boring. Oh my gawd Smartlog is the iPhone of the SEI market. Smartlog will take logs from your whole environment (including syslog) and provide one google like view with google like scalability into real-time events in your environment. Dump you bloated overpriced RSA Envisions, Arcsights, etc and go to your local CheckPoint retail store and pick up Smartlog for free! Imagine putting google on top of SmartTracker and you have a screaming Event Integration and correlation tool. Why does this give me such a viagra techie buzz? Because for the first time in my life the damn tool is integrated with the rest of the management environment. Its like 6th graders being able to fly Air Force drones. The controls are all the same all integrated into a single environment. It took me days to figure out RSA Envision and another couple days for the damn queries to complete they were so slow. If you can search google you can search SmartLog. One person can run the whole environment and not a team of silo’d individuals working on specific products. 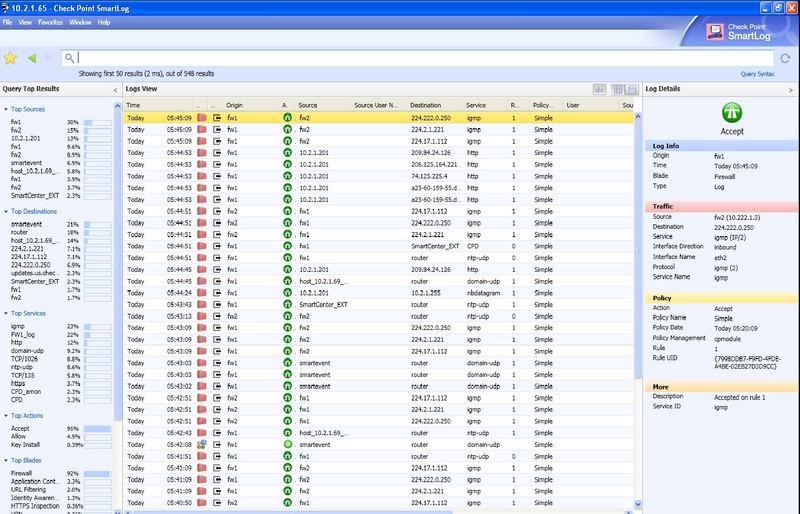 You can get a single vision into your environment and not 10 reports from 10 different tools. Unified Centralized Management – Once again Check Point hits it out of the park with their strength. Unified Centralized Management. Lower costs to train, maintain, upgrade, etc. Higher availability because fewer people are required to debug the environment because they are using a single tool. Scalability – like Google scales. Separate system with lots of memory. This baby eats memory like chocolate. Go crazy: 64 gig is a nice round number. Might as well install SmartEvent and Reporter on same box as your Log Server and Smart Log. They all will work off your local logserver. SmartConsole SmartLog client needs .NET 3.5 SP1. Have to install separately. I’ll update as I learn more about how to best integrate into MDM. I’m in techie wonder land!! So I recently had the lovely experience of dealing with H323. H323 is admittedly a ugly protocol but its been around for years. I assumed CP had it figured out…WRONG. Basically you have to turn off the INSPECT script on H323 and let it go natively. 7) Make sure you create a rule for each direction. So two rules. Creates a basic packet filter (allowing return packets). Make sure you test this with failover. Some phones don’t like gratuitous arps if they are on directly connected VLANs. I just saved you 2 days of hunting. Support center should have this one wired but they don’t.